NETWORK FINALS: 60 MINUTES and THE SIMPSONS lost 0.1 in final numbers. In addition, SUNDAY NIGHT FOOTBALL adjusted to 6.1. CABLE HIGHLIGHTS: Bravo’s DIRTY JOHN premiered at a solid 0.36, with lead-ins REAL HOUSEWIVES OF ATLANTA up 0.06 to 0.75, and REAL HOUSEWIVES OF ORANGE COUNTY at 0.56. The news for AMC’s THE WALKING DEAD was mixed at best, as the midseason finale gained 0.16 from last week to 1.96, but that was down a huge 1.40 from the 2017 midseason finale (which was itself down 1.73 from 2016). TALKING DEAD was up 0.04 from last week to 0.81. Elsewhere in scripted, Hallmark’s movie A SHOE ADDICT’S CHRISTMAS was at 0.72. Nickelodeon’s 11AM SPONGEBOB ticked down to 0.34. Adult Swim’s DREAM CORP LLC was at 0.31/0.30, compared to last week’s 0.29/0.25. BBCAmerica’s DOCTOR WHO rose 0.05 to 0.30. Freeform’s original movie THE TRUTH ABOUT CHRISTMAS was at 0.19. On Showtime, RAY DONOVAN climbed 0.04 to 0.19, ESCAPE AT DANNEMORA climbed 0.04 to 0.09, and ENEMIES was steady at 0.03/136K. Lifetime’s movie JINGLE BELLE was at 0.17. Starz’s OUTLANDER ticked up to 0.15. On HBO, CAMPING gained 0.02 to 0.10, MY BRILLIANT FRIEND held at 0.05, and SALLY4EVER ticked up to 0.05. 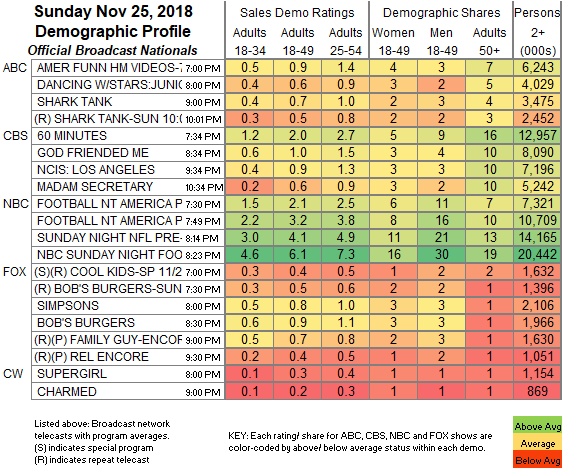 In unscripted, TLC’s 90 DAY FIANCE gained 0.02 to 0.61, and RETURN TO AMISH was up 0.05 to 0.31. The SOUL TRAIN AWARDS were at 0.52 on BET (with the after-show at 034, and the pre-show at 020) and had simulcasts on VH1 at 0.16, on BET HER at 0.30/130K, on Logo at 0.01/37K, and on MTV2 at 0.03/100K. On E!, KEEPING UP WITH THE KARDASHIANS slipped 0.03 to 0.52. 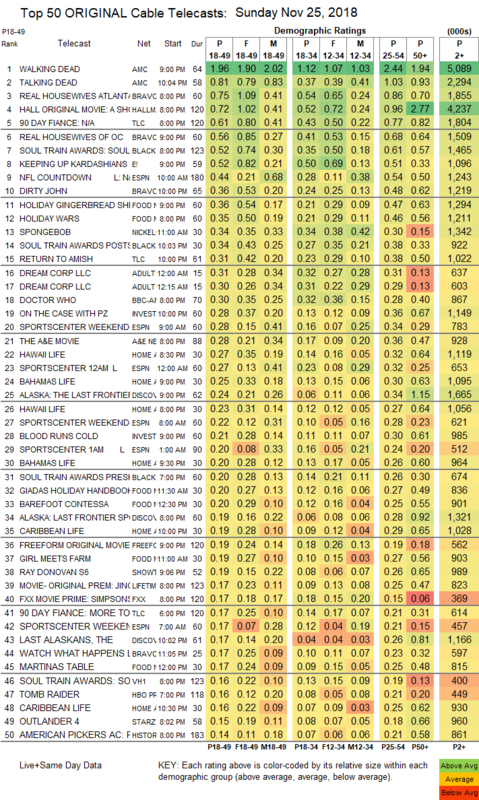 On Food Network, HOLIDAY GINGERBREAD SHOWDOWN was at 0.36, and HOLIDAY WARS was at 0.35. On ID, ON THE CASE climbed 0.03 to 0.28, and BLOOD RUNS COLD was at 0.21. HGTV’s line-up was led by HAWAII LIFE at 0.27/0.23, compared to last week’s 0.22/0.21. On Discovery, ALASKA: THE LAST FRONTIER was steady at 0.24, preceded by a special at 0.19, and with lead-out THE LAST ALASKANS at 0.17.